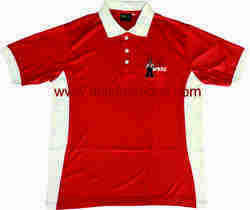 Offering you a complete choice of products which include customized t-shirt and red and white cut & sew polo t-shirt. Pattern - Cut and Sew Polo T-shirt with Pipping on Sleeves. Colours - White, Black, Red, Maroon, Navy Blue, Yellow, Green, Royal Blue.